After our adventures in the distillery, we finally made it to Huacachina. Huacachina is a tiny village centred around a natural oasis in the middle of the desert. The lake at its centre looks like an emerald, and palm trees cluster around the edges of the water. The village itself is tiny – you can walk the entire circumference in about half an hour – and even though most of the walkways are paved, there is always a thin dusting of sand everywhere you look as the desert crawls back over the stones. Even the air tastes hot and dry here. The village is something of a tourist trap. There are a lot of hostels there, and very few actual houses. Most of the other buildings appeared to be shops, hotels, bars and clubs, and as we were visiting in the off-season we became the centre of attention very quickly. At first, this didn’t seem too bad – it was much easier to haggle for stuff and we got some pretty good deals – but we soon found that being one of the few tourists in an empty resort had its downsides. Our guide arranged for us to stay (and eat) at a swimming pool for the afternoon. We stayed there for a couple of hours, but after a group of men started hanging around the girls’ toilets – which, incidentally, had no locks on the doors – we decided to make a quick exit. Any dodgy loitering around the girls’ toilets was soon forgotten, however. One of the main attractions at Huacachina is the chance to try desert sports – mainly driving around in a dune buggy and having a go at sandboarding. The dunes in the Huacachina Desert are enormous – easily taller than fifty feet, and with the kinds of long, swooping curves that are just perfect for a dune buggy. Sometimes they had razor thin peaks and you would find yourself teetering over a ledge no thicker than the fold of a birthday card. The dunes looked so flimsy that it almost seemed as if the dune buggy would plough right through them, but they were surprisingly firm. We could swoop up and down the dunes with no problems at all, and despite the enormous drops, I wasn’t the slightest bit afraid. Sandboarding, however, was another matter. For the uninitiated, sandboarding is basically when you slide down a dune on a board. It sounds simple enough: we did it lying face down on the board, and – when the instructors weren’t looking – sitting on the boards in the same way that you would do for a toboggan. However, when your face is dangling over the edge of a fifty-foot sand dune, your friends are specks at its base and the only thing you can look at is the drop spilling out beneath you, it gets a lot more frightening. But once you’re sliding down the dunes with the wind in your hair and the sand rushing out behind you, the fear is completely forgotten. The only downside is that the sand gets everywhere. Ten months later and I still haven’t got all the sand out of my trainers. For the last part of our trip to Peru, we would be staying in an oasis in the Huacachina Desert – a tiny little place exploding with palm trees, with airless, empty sand on all sides. It was a long way away from Cusco, and as we would be passing through the Nazca region to reach it, we decided to stop and have a look around. The first place we visited was the Chauchilla Cemetary at Valle Las Trancas. Not far from the city of Nazca, the Chaucilla Cemetary is the remnants of a pre-hispanic burial ground in the middle of a desert. Not a lot is known about the site, but it appears to have been in use by the Nazca civilisation since the 9th century AD. Calling it a cemetery does not give an adequate description: the graves are open pits in the sand, and if you peer over the wooden railings you can see their mummified occupants. The mummies are extremely well preserved: it is possible to get an idea of the possessions, clothing and hairstyles of the Nazca culture. Unfortunately the cemetery had been disturbed over the centuries by various grave robbers. Standing in the stifling heat, staring into an open grave with the grey desert sands on all sides, it was very easy to forget the bustling city we had just left behind. After stopping in at a pottery shop – where the owner made traditional Nazca pottery using all the ancient techniques – we found the Nazca Lines. I confess, I had expected something very different. Rather than pulling up at a sparklingly efficient tourist site, we instead pulled over on the side of the road, right next to an enormous tower, constructed of thin metal poles and swaying dangerously in the breeze. We had been driving through the Nazca Lines for hours and had simply not known it. All we had to do to see them was to climb to the top of the tower, which was creaking quietly in the wind. The Lines themselves were nevertheless impressive. Etched into the expanse of dark sands before us and sprawling over acres of space, the Lines were strangely proportioned. I could not call them crude – not when the level of detail, time and effort that had gone into them is so clearly visible – but the peculiar, almost geometric pictures were nevertheless intriguing. The one thing that really struck me was that this was a way of understanding how the Nazca culture saw their own world, and as I descended the tower – trying to ignore the occasional wobble – I wondered how much more of the Nazca culture modern society would ever be able to see. Then, it was off to a pisco distillery for lunch. For those of you who do not know, pisco is a kind of grape brandy local to Peru which is about 40% alcohol. We were given a tour and a free tasting – in the form of several shots – before we had our lunch, which left most of us extremely giggly at the very least. I’m afraid to say that after our free tasting, I don’t remember much of the museum we visited afterwards – apart from that I found all the exhibits extremely funny. After my adventures in the Urubamba River, I got on a bus to the town of Puno, where I would spend a few nights and visit Lake Titicaca. The trip was a ten hour bus ride and I was very slightly ill, so I wasn’t really looking forward to it. However, the company we were travelling with had organised a proper tour, and every so often the bus would stop at a tourist attraction and we would all pile out and take pictures. Our first stop was just outside Cusco, at the town of Andahuaylillas. We were there to see the St Peter and Paul’s church, that our guide insisted was the Andean equivalent of the Sistine Chapel. It was certainly very beautiful – all covered in bright frescoes and ornate gilt friezes – and everywhere we looked there was gleaming gold and the fading faces of saints. The whole church was filled with lilies and the smell of incense, and in every little alcove there stood a mannequin of a saint, swathed in bright robes and adorned with gold, their empty eyes staring down into the church. Then, we moved on. Our next stop was a small town called Raqchi, to see the ruins of the Temple of Wiracocha. The ruins dominate the town, towering far over the roofs of the churches and homes beneath. All that is left of the ancient Incan deity’s temple is a long, thin wall, over three hundred feet tall, and a small complex of walls that lie behind it that made up an old city, or perhaps some religious buildings – no-one is really sure. After our stop at the temple, we had a Peruvian buffet lunch – where the band played ‘The Sound of Silence’ on the pan pipes – and then travelled through the La Raya mountain pass, where the air was so cold our breath hung in front of our faces like little clouds of steam. Then, we moved on again and did not stop until we came to the town of Pukara, where we were guided through a museum of pre-Incan culture. It was, without a doubt, one of the creepiest things I have ever seen. The museum was filled with artefacts (mostly statues) from the Pukara culture, a pre-Incan civilisation that dated from approximately 600 AD. It is thought that most of the statues have some kind of religious significance, representing gods and other deities. However, almost all of them were carved holding the heads of their enemies, chewing headless bodies, their dismembered enemies sprawled around them. Our guide said that this was potential evidence of human sacrifice or cannibalism in the Pukara rituals; you could feel the collective shudder run around the room. We all huddled back onto the bus after that and headed for Puno – a bustling town just on the banks of Lake Titicaca, where we would spend the next few nights. The next day, we would be heading out onto the lake. After I had left Macchu Pichu, I had just over a week left in Peru. The official trek had finished and now, we had about eight days to run wild in Peru. Some of us chose to do independent travel, and some of us chose to go on the trips run by the travel company, which went to the Amazon, Lake Titicaca, and the Nazca Lines. I chose Lake Titicaca and the Nazca Lines – while the Amazon wildlife is undoubtedly fascinating, it has developed several interesting ways of killing people and I didn’t really fancy that. After Macchu Pichu, we returned to Cusco, feeling mildly dazed and incredibly hungry after the whole experience. Most people used the day to shop around for souvenirs, but myself and a few others decided to leave the markets behind and sign up for white water rafting instead. While everyone else slept off a hangover, we clambered into a minibus, nursing our pounding heads, and set off for the hills. We were going to be rafting down the Urubamba River. It’s a wide, blue ribbon of a river that twists and turns through the grey and brown hills, getting ever wider as it goes until it fans out into a huge, shallow bay filled with pearly pebbles. All the twists and turns, the jagged black rocks and the huge, high walls on either side made for some pretty good rapids. Our guide – who did all the steering – told us that the river was once sacred to the Incas, and as we drifted along the silent, deserted river, I could almost believe it. I wasn’t very good at rafting. I was more enthusiastic than adept, and jumped into the freezing cold water a little too excitedly when our guide told us we could swim in the river. I spent the rest of the trip shivering and squeaking when the cold river water ran down my sleeve and into my armpit. It was still a lot of fun, once I worked out how to use the oar properly, but I don’t think I’ll be becoming an instructor any time soon. It was also pretty hard work, especially when we had to row against the current, and every so often we all had to throw ourselves into the middle of the boat when we were navigating some of the trickier rapids. Even though we didn’t go down anything higher than a Class Three rapid – and our instructor made us get out and walk along the shore if he thought it would be too difficult for us – by the end of it we were so exhausted we could barely clamber back up the river bank. Well and truly shattered, we slunk back into the minibus, fell asleep within about five minutes of sitting down, and headed back for Cusco. 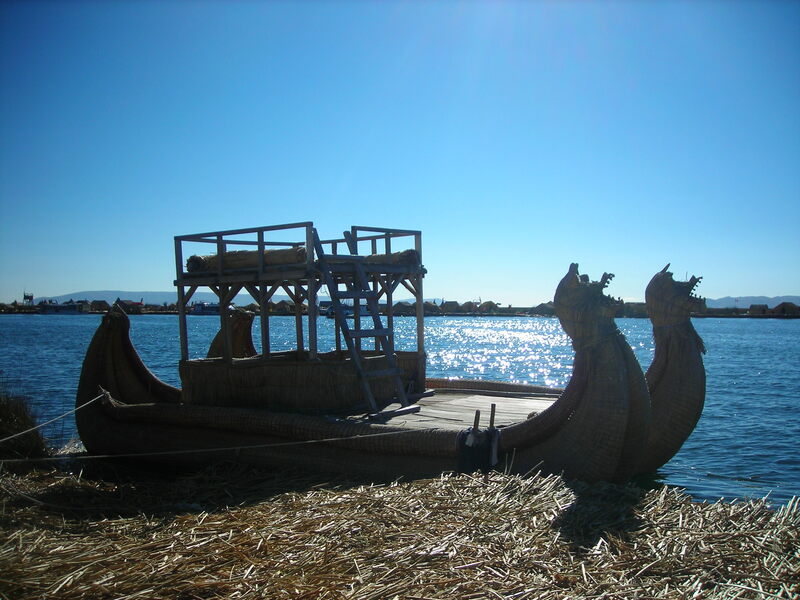 The next day, we would set off for Lake Titicaca. A week into my stay in Peru, I finally got the chance to visit Macchu Pichu. For as long as I can remember I’ve been fascinated by the idea of lost cities, both fictional and real, and I can still vividly remember the day when I first heard about the discovery of the ancient Incan complex, deep in the Peruvian jungle. On that cold, rainy day more than ten years ago, even as I cracked open the encyclopaedia I still felt a rush of excitement at the thought of seeing the stone ruins. We didn’t trek straight into the Macchu Pichu complex, as I was hoping we would. We didn’t take the Inca Trail – the route which leads straight up to the Sun Gate at Macchu Pichu – but instead, trekked through the Lares Valley to the old sun temple at Ollantaytambo and got the train to Macchu Pichu Pueblo, where we stayed the night. Our tickets had been bought well in advance, and so when we arrived at our hostel, all we had to do was wait for the next morning, when our chance to see the lost city would come. It was an incredibly early start. We set off at sunrise and climbed onto a tour bus, breakfast in hand, as we wound our way up the mountain path. Vines and creepers surrounded us; crawling down the mountain on one side, while a sheer drop was on the other. We drove higher and higher, the jungle plants growing thinner and thinner, until we finally reached the complex. By that time, it was about seven or eight o’clock in the morning, and the ticket barrier was already very busy. Once our tickets had been verified, we climbed another set of smooth, Incan steps, half overgrown by plants, and finally got our first glimpse of Macchu Pichu. The enormous stone ruins were half-open to the elements, making the open rooftops look like the ribs of a skeleton. Huge terraces ringed the mountainside in steep, narrow steps, running right up to the summit, which was half-hidden by plants. The smooth, pale stone gleamed in the early morning sunlight, making the complex beneath our feet look as if it was almost glowing. Vines, trees and flowers crawled up the mountainside and the ruins came down to meet them, disappearing into the jungle as they crept further down the mountain. And above it all, the enormous mountain of Huayna Pichu towered over us, silent and dark. It was, without a doubt, one of the most spectacular things I have ever seen. Because we arrived so early in the morning, the site was relatively quiet. We were by no means the only tourists there, but the complex was quiet enough that we occasionally had patches of the ruins to ourselves. They were more than beautiful; as we explored the Incan city the old buildings towered over us, crumbling in places but still majestic. We wound our way through tiny paths and steep steps in the quiet, still morning, half-lost among the ruins. At the centre of the city there was a small field, where llamas and alpacas were grazing. Occasionally they got bored and climbed out of their pen to explore alongside us, and more than once we turned a corner to find ourselves face to face with an angry-looking llama, as though we had wandered into its living room. As we moved through the old city and the day grew hotter, we saw more and more tourists, until by the time we left – around midday – the place was completely packed. I’ve tried my best to do the city of Macchu Pichu justice, but words will always fall short when describing a place like that. It’s far more than just looking at the ruins; it’s more like standing in the midst of history, or finding a little pocket of the world that time has left in peace. With so many of the old Incan complexes destroyed by the Spanish conquistadors, seeing something so whole and so untouched almost felt like a gift. 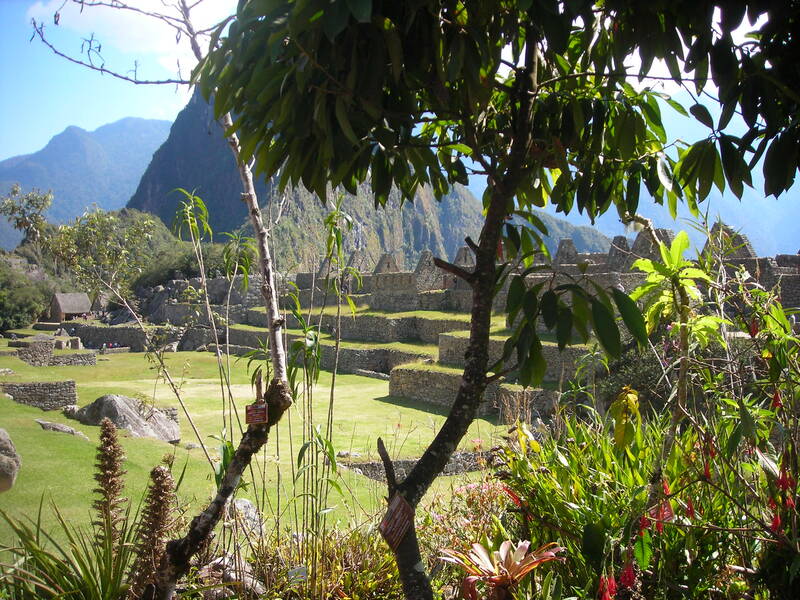 It is highly likely that there are other lost Incan cities hiding somewhere in the Peruvian jungle; countless Incan paths – smooth, paved paths, not just dirt tracks – have been found leading away from Macchu Pichu and spiralling off into the jungle. Those paths must have gone somewhere, although nobody knows where. The thought that there are dozens, possibly hundreds of old Incan cities just waiting to be discovered is an incredible one. Perhaps, in the future, they will be discovered by someone much luckier than I am, and whoever pulls back the vines and looks upon the cities for the first time in centuries will get to see the Incan civilisation as it was meant to be – ancient, proud and untouched. But until that day, we must let Macchu Pichu keep its secrets. Our trek began on the fourth day of our trip to Peru, and when that day dawned, I was terrified. We were going to be trekking through the Lares Valley and reaching altitudes of over 4450m above sea level – and I hadn’t done any training. Before I left for Peru, the thought of exchanging a good book on the beach for an hour on an exercise bike seemed laughable; once I was there, I began to regret it. However, the trek wasn’t as bad as I was expecting it to be. Admittedly, I was expecting to be airlifted back to Lima within the first half an hour, but the point still stands. But I was pleasantly surprised: the trek was hard work, but it wasn’t too difficult for me to handle and I recovered very quickly. I was also fortunate in that I didn’t suffer from altitude sickness – the worst I had to contend with was shortness of breath and I minor headache. I was incredibly lucky not to be throwing up or passing out: at worst, the extent of my altitude sickness was never more painful than a minor hangover. My lack of altitude sickness allowed me to really appreciate the beautiful Peruvian countryside. We began trekking at the best possible time, just as winter was easing into spring. It didn’t rain once – even though we woke up with ice on the tents more than once – and we were greeting by glorious sunshine every day. We really saw the Lares Valley at its best. There was still snow gleaming on the black mountains, enormous, blue-green lakes lay feet below the mountain paths, and scrubby green and brown plants covered almost every inch of the mountainside. As we walked, we passed herds of llama and alpaca grazing in between the rocks. Old shepherds’ huts were dotted around the valley, each one built of dry stone and looking as though they’d been abandoned for years. Occasionally, children from a nearby village would run up to us and ask for sweets, or try to sell us drinks or traditional Peruvian clothes. We learnt to carry a small stock of boiled sweets with us at all times, so they wouldn’t have to leave empty handed. The full trek lasted about four or five days. During that time, I had a bath in a suspiciously yellow hot spring, almost fell down several mountains, almost got abandoned in some old Incan ruins and missed out on a chance to buy a litre bottle of beer. All the while, we were walking through some of the most beautiful countryside I have ever seen. At the time, it was a little bit difficult to believe that I was really there; it all looked so beautiful and so surreal that I felt as if I was trekking through Middle Earth. And then, finally, we arrived in Machu Picchu.